A Spinner bot is a bot that utilizes a spinning weapon as its main form of attack, much like using the blades of a helicopter. The advantage of a Spinner is that they work both offensively and defensively in a 360 degree radius around the bot. Spinners also tend to inflict more damage with its attacks because the spinning weapons can build up a good amount of speed by the time they make contact with the enemy. And finally, just by the design of the spinner, you have multiple weapons in motion and if one of the weapons is destroyed you still have the other blades of the spinner available for attack. Most commonly we see a dual or quad based spinner (2 or 4 blades), but occasionally you will see a trinary (3) or even single bladed spinner. The single bladed spinner is least effective of all because you need to either develop a ballance for the lopsided weight design, or suffer the effects of slower spin because of poor ballance. For an example of a Trinary based spinner see "Golden Hex" located in the "Bots On Display" section of this website. Although Golden Hex actually has 6 spinner arms, it is in fact based on a trinary system. Regardless of how many blade arms your spinner has, the main thing to keep in mind is ballance. Having equal weight distribution along the blade arms increases the efficiency of your spin. A common mistake that newer Roboforge players make is assuming that Rotators are the component of choice for creating spinners. If you pull up a Rotator in the design panel and look at its 3-D view you will see a major problem with Rotators right away : Only 1 of the faces of the Rotator have a connector. During the Beta days of Roboforge the rotator used to have a connection point on both faces. Beta testers took advantage of this and stacked Rotators, one on top of the other, so that their combined spinning really got their weapons whirling. I am unsure why Roboforge continues to cripple this component by having only one side with a connection point because players have simply begun using Joints in place of rotators for creating Spinner weapons and Joints are far superior to Rotators in for this use. Without the double side connections it is very difficult to stack a rotator effectively. Another problem inherrent with Rotators is that they are ALWAYS active, thus continually draining your power supplies. Joints, on the other hand, only become active when your bot calls upon them from within the AI. Because of the continuous motion Rotators only spin in one direction. This means that once they hit something they stop and will not move again until either their pathway is clear or a deadlock has been called. Joints, on the other hand, can swing their spinner in both directions, not only freeing themselves from entanglement but dishing out double hitting damage. Frankly, the only use that I can see in Rotators would be for scanner coverage. A scanner placed on a rotator would effectively cover 360 degrees around your bot, much like a spinning radar dish. However unless your AI is very fast the information gained from such rotation would not be updated very efficiently. 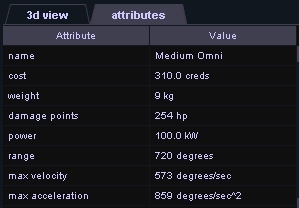 In Diagram 1 you see the Attributes of a Standard Medium Omni. This is a nice joint to choose for a spinner because it has a fast acceleration and velocity rating. It also allows 720 degrees of rotation (2 spins) and requires 100 Kilowatts of power which means it can handle a decent weight load. If we stack a few of these upon each other then we can get a very nice weapon array moving at quite a destructive speed. Of course we don't want to stack too many joints or the power requirements would be quite enormous and we would have to sacrifice other designing aspects in order to provide more energy units to power it. Keep in mind as well that having a spinner will not be very effective if you dont plan for somekind of movement for it. If it just sits flat and spins the enemy can attack overtop or underneath your weapons. Another joint other than the 45 degree Standard might be used to increase up/down tilting. However the type of weapons that you attach to your Spinner arms will also effect how much tilt you desire. The thing here to keep in mind is that your design is able to reach as close to the floor as possible in the event an enemy tries to snake in a low weapon arm, or simply has an "attack from the bottom" scheme which is deadly to all floater bots. Diagram 4 illustrates how swiveling the bottom Medium Omni will bring the lowest point of our Spinner attack to the side effectivly protecting and attacking from that angle. This kind of spinner bot would have several different moves used by the AI. First there would be the spin move that makes your blades turn. 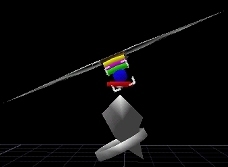 There are two possible options here that could be used : A single spin move utilizing 2 snapshots, 1 turning the stacked joints all the way to the left, and the other turning them all the way to the right. This has a nice benifit over Rotators in that once you're bots blades come into contact with something then the current snapshot in the move is inturrupted and it tries to run the next snapshot, which spins the blades in the opposite direction. You end up with spinning blades that bang back and forth against the enemy producing very nice damage. I have noticed that this method does experience some form of delay as the game mechanics attempt to recognize that a snapshots movement is hindered and continues on with the next snapshot. A more complicated, yet more effective, method would be to create 2 spin moves. One would be a stacked joint spin to the right and the other a stacked joint spin to the left. You would then need to create a detection scheme in your AI to know which direction is active and upon ANY collision of your spinner have it reverse directions. The only delay you experience with reversing direction in this method would be resultant of a slow AI. Next you would want to design some kind of detection method for the best possible tilt angle in attack. This falls outside the bounds of this particular tip article, but look for further instruction in the "AI made easy" section. Finally, you would want your bot to use the lower most Standard Omni joint to continually keep the "facing" of your Spinner assembly towards the enemy, this way your tilt angle will be effective in hitting crucial enemy points, or simply be used as a defensive measure. Again, the AI needed for such detection falls outside the scope of this article and can be found in the "AI Made Easy section". These are only basic suggestions to help you get started on a Spinner design. This article is designed to help explain the workings of a Spinner and what kind of components may be needed to design one. The AI of a Spinner bot can be just as crucial as the design. More information on AI can be found in the "AI Made Simple" section of this website.